You can click on any image to get a larger picture with more detail. I was recently reading the history of the Rolex Explorer, a watch made famous when it accompanied Sir Edmund Hillary to the top of Mount Everest. Temperatures on Everest average -33 degrees F (-36 C) and can drop as low as -76 degrees F (-60 C). This started me wondering if a humble Invicta watch could withstand similar torture. I decided to find out. 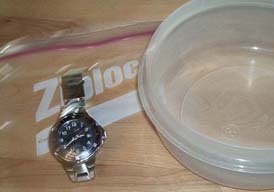 The test is simple: Place an Invicta watch into a container full of water and then freeze it solid for 24 hours. The temperature of a residential refrigerator doesn't get as cold as Mount Everest; the typical range is 0 to 5 degrees F. So it won't be as harsh as letting it sit on top of a mountain, but it also won't be attached to a wrist, which would warm the watch up considerably anyhow. In reality, it is very unlikely that Hillary's Explorer ever got to a sub-freezing temperature. However, Rolex does give owners the option having the movement lubricated with a special wide-temperature oil that is good to -40 degrees. 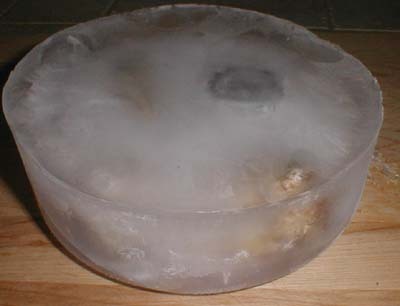 After 24 hours, the watch will be removed from the freezer. Periodically, the time will be read and logged. 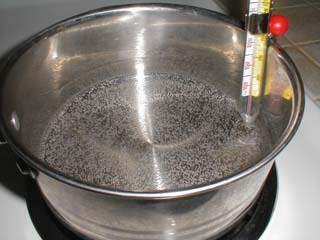 After this, the watch, and the ice encasing it, will be submereged into a pot of boiling water. 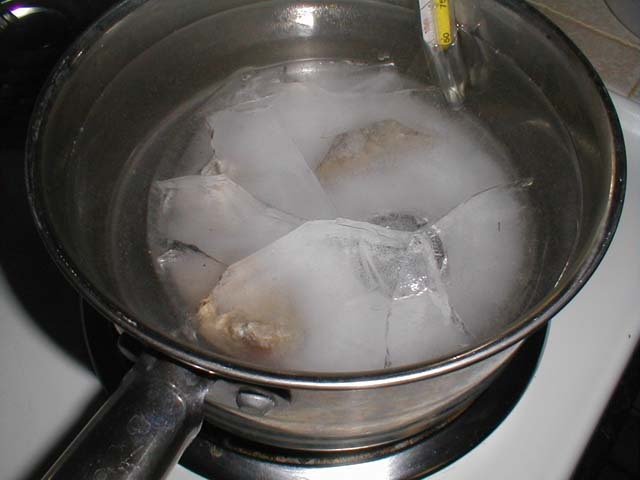 The ice will be allowed to melt, and the watch will be boiled for two solid minutes. A final time reading will then be made. 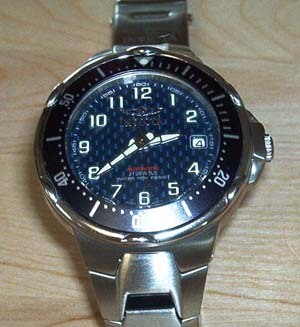 I have several Invicta watches, most of which I like quite a bit and wouldn't want to see get hurt. There's one, however, that I don't like all that much, the Invicta 9373. From the images that I saw, I thought I would like it, but once I saw it in person I knew it just wasn't my style. It's been banging around in a drawer for several months now, untouched and unloved. I figure that by making it the focus of this test and even giving it its own webpage that it won't feel ignored. The 9373 has a self-winding Japanese movment, with a reserve capacity of about 40 hours, which is suitable for the 24-hour test. The 9373 doesn't have a screw-down crown to keep it water tight. It's supposedly good for a diving depth of 100 meters or so, but with the temperatures and presures involved in the test, it doesn't seem prudent to take the risk of introducing moisture into the case. For this reason, the watch will be placed in a Zip Lock bag. I placed the watch in the bag and removed as much air as I could by "pushing" it out, and even attempting to form a partial vacuum by sucking the air out with my mouth. The result was disappointing. The bag floated, raising part of the watch above the surface. 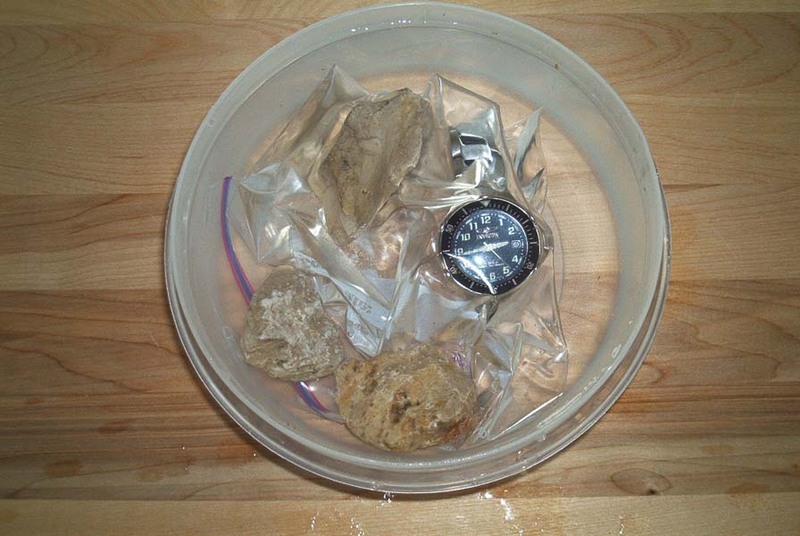 To sink the watch, I placed three rocks on the bag. 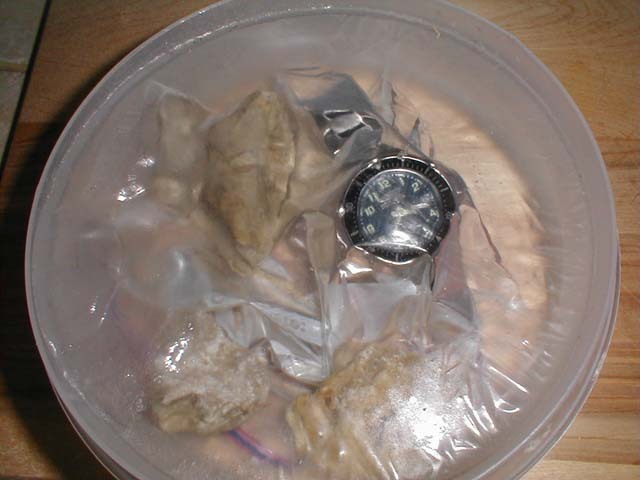 The watch was now fully submerged and ready for its trip to the freezer. Here it is in the freezer. At 3:51:00, I took a time reading from the watch. It read 3:51:04. I will take periodic time measurements and report the results. 3:51:00 3:51:04 4 Watch placed in freezer. 4:51:00 4:51:04 4 Ice has started to form. Difficult to read the time. 6:31:00 6:31:06 6 Ice is nearly solid. 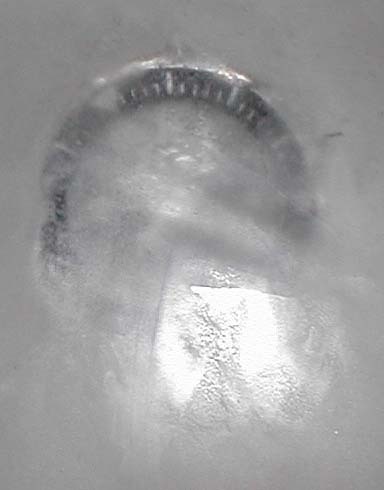 Polished a "window" in the ice with my finger. Has gained two seconds since last reading. 7:25:00 7:25:07 7 Took a picture. The rocks look like chunks of frozen chicken. It is apparent that the cold is causing the watch to run fast. This is the opposite of what I thought would happen. I assumed that the oil would thicken, causing more friction, and the watch run slow as a result. 9:01:00 9:01:09 9 I don't know how well the watch keeps time without being frozen; it never occured to me to measure it before. In five hours, it has gained five seconds. So in a full day it would gain 24 seconds, which is comparable to other (although extreme) reports that I've heard about Invicta's automatic movement. 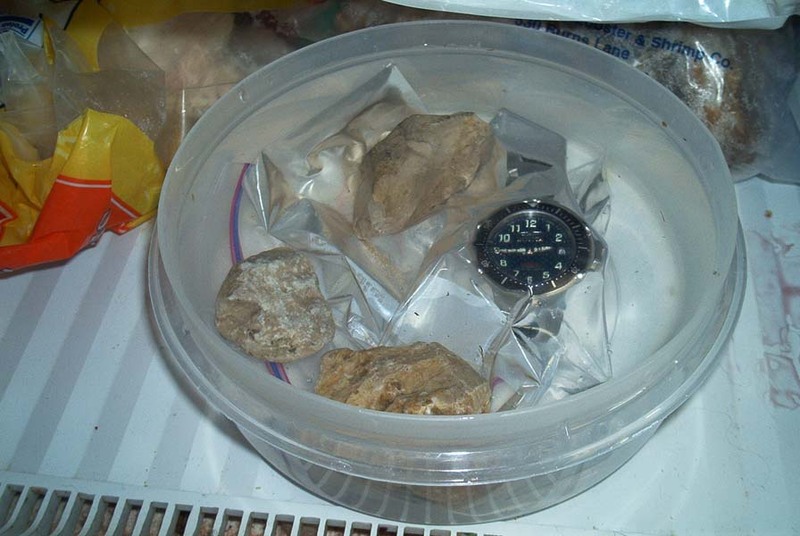 10:15:00 10:15:09 9 The watch has been in the freezer for slightly more than six hours. Still ticking away happily. I doubt the core temperature is yet as low as it can get, however. 11:23:00 11:23:10 10 Last measurement of the night. 8:15:00 8:15:?? ?? The ice between the surface and the watch's crystal has become cloudy (picture), making it impossible to see the very thin second hand. It is possible to see the minute and hour hands though, which show that the watch is still running, and that it is keeping reasonable time.The next time measurement will be taken during the defreeze process. 1:33:00 1:33:?? ?? Watch is still running. Two and a half hours to go until the defrost procedure beings. 6:30:00 6:30:?? ?? 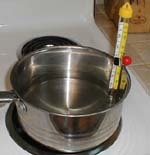 Heating water on stove. Watch has been in the freezer for 26 1/2 hours. My original intention was to heat the watch to well above boiling. I decided against doing this because it would represent an unrealistic stress on the watch. For a while, I toyed around with the goal of 110 degrees, but after touching 110 degree water, I realized that I take showers warmer than that. So I decided that a good temperature would be around 125, even though this is much warmer than would ever be encountered in nature. It's amazing how difficult it is to try to set an exact temperature. The temperature lag in the water makes it very frustrating to home in. Eventually the water temperature was where I wanted it. 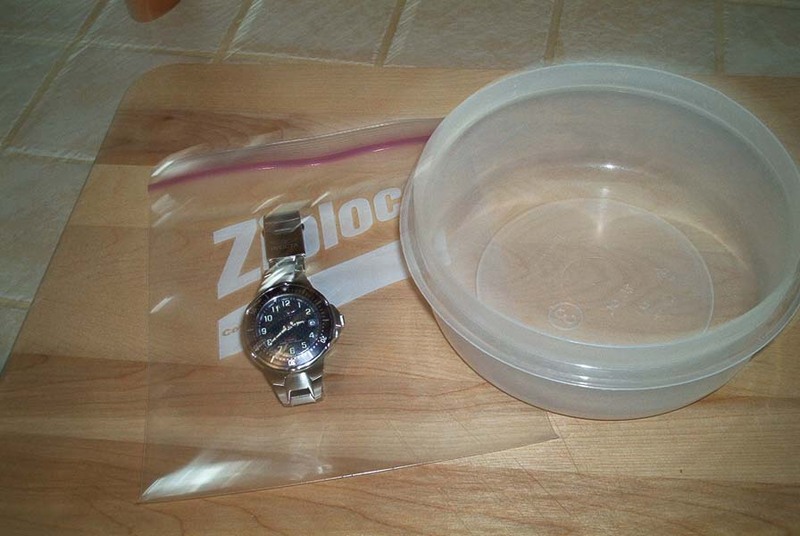 I removed the iceberg encased watch from its tupperware container. Into the water went the iceberg. Accompanied with a very loud sound, deep cracks formed in the ice. Had the watch been harmed? 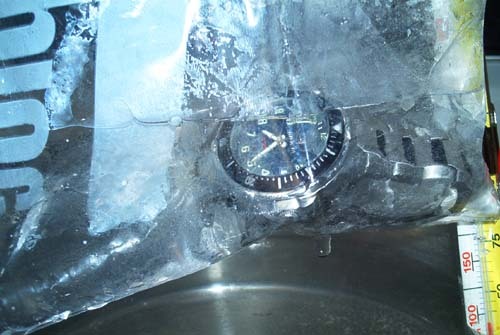 For nearly an hour, I slowly heated the ice-encased watch, taking notes in the process. 7:07:00 7:07:?? ?? 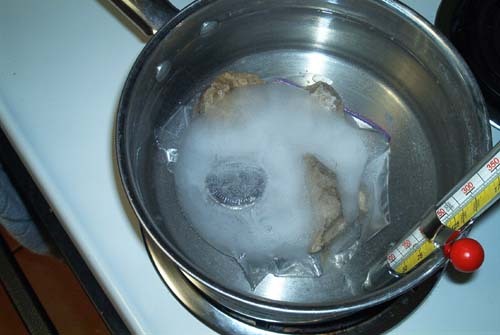 Ice block in water. Deep cracks form in ice. 7:09:00 7:09:?? ?? Water temperature lower than thermometer can register. 7:10:00 7:10:?? ?? Before the watch was placed in the water, there was half-an-inch of ice above the crystal. It has been reduced to 1/4-inch. 7:12:00 7:12:?? ?? 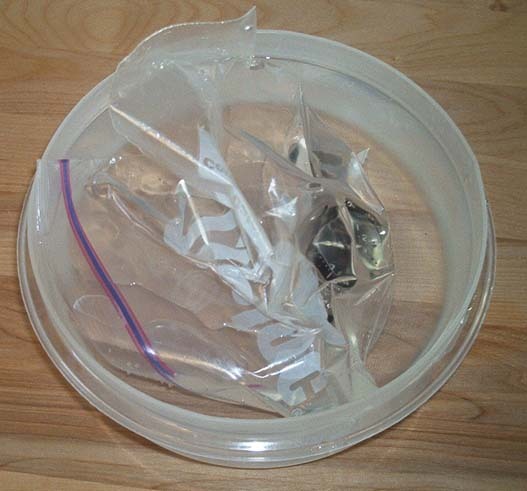 Parts of rocks and plastic Zip Lock bag exposed. 7:14:00 7:14:?? ?? 1/8-inch ice over crystal. 7:16:00 7:16:?? ?? Surface of crystal (through bag) starting to be exposed. 7:19:00 7:18:47 -13 Able to take first time measurement. The watch is now thirteen seconds slow. 7:21:00 7:20:47 -13 Two rocks are now free of the ice. 7:23:00 7:22:47 -13 Remaining ice and rock removed from water. 7:24:00 7:23:47 -13 There was a LEAK in the bag! It is nearly half full of water. Not sure if this happened during freezing or heating. 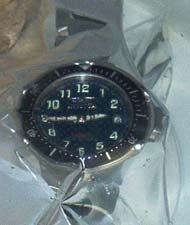 7:25:00 7:24:47 -13 With leak in bag, no point keeping watch inside of it. Camera batteries died. 7:26:00 7:25:47 -13 Water at 100 degrees F.
7:31:00 7:30:47 -13 Water at 115 degrees F.
7:34:00 7:33:47 -13 Water at 125 degrees F.
7:39:00 7:38:47 -13 Water at 140 degrees F.
7:41:00 7:40:48 -12 Only 12 second time difference now. 7:43:00 7:42:48 -12 150 degrees. 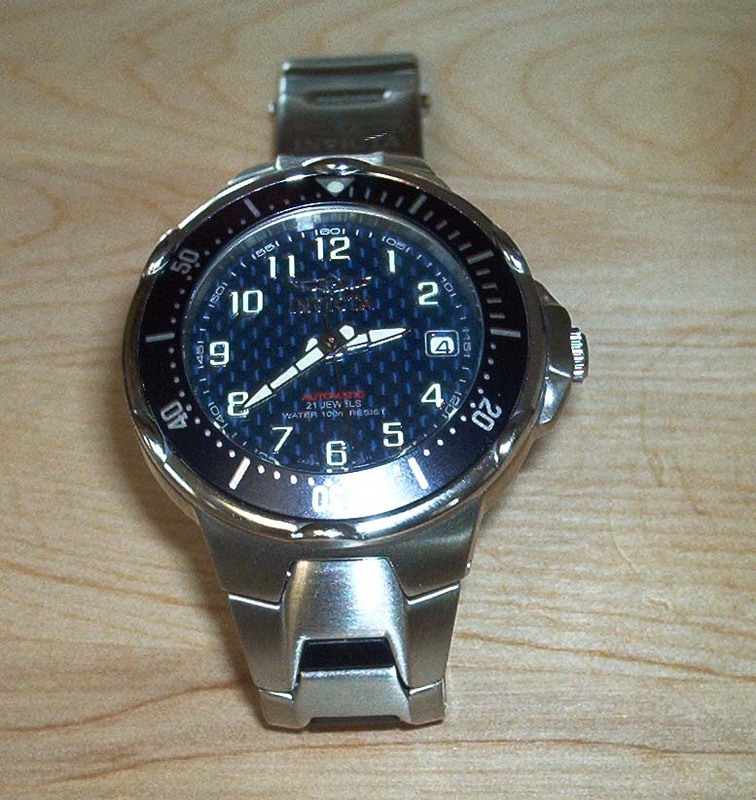 The watch sustained an above 125-degree temperature for 12 minutes, gaining one second in the process. After the watch cooled off, I inspected it and concluded that it was visually identical to before the start of the torture test, and that no moisture had entered the casing. However, the test has most likely had a negative impact on the rubber seals that keep the watch water resistant. 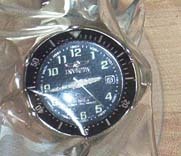 The Invicta torture test has demonstrated that a typical Invicta watch can withstand extreme temperatures and continue functioning. Although time-keeping varied during the test, it was never severe enough to consider the watch unreliable.